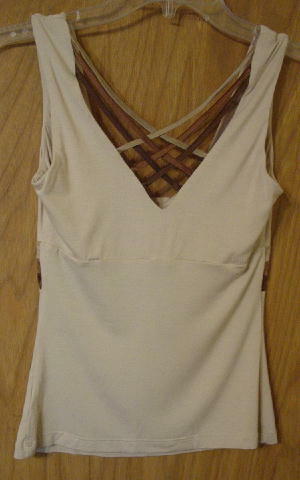 This 93% rayon and 7% spandex sleeveless sand color blouse has a contrast in three shades of brown of 95% silk and 5% spandex. There is a 15" wide neckline which has a draped appearance. 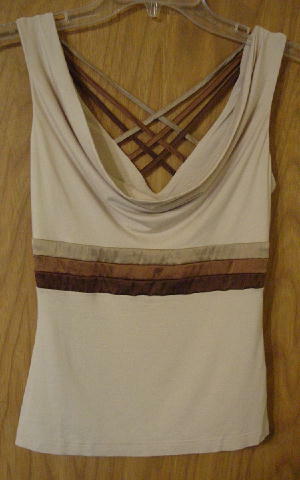 The back has a 9 1/2" deep V with crisscross straps in three shades of brown. 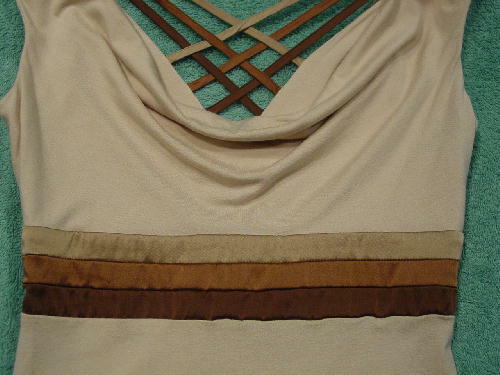 The front has horizontal stripes in the same three shades of brown. The front is lined (with the same exterior fabric) from the lower dark brown stripe upward. The back upper section (from the horizontal seam upward) is also lined. bottom hem side to side 12 1/4"